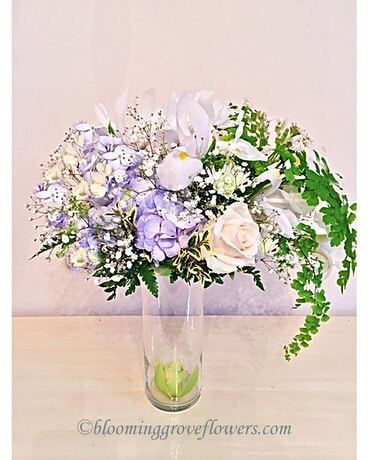 White iris, blue hydrangea, white roses, accented with 'baby's breath' florets and beautiful 'maiden hair' foliage, delivered in a tall cylinder glass vase with the orchid inside. Suitable for special occasions like engagement or wedding congratulation gift, new baby boy or girl (blue hydrangea replaced by pink one; price adjustment possible), graduation or retirement gift, etc.. Flowers and Containers subject to change based on season and availability. However we will create something similar using products with an equivalent or higher value: we will find substitution to assure the best quality and presentation for your special gift.